In making yet further revisions to our paper on Hawtrey and Cassel, Ron Batchelder and I keep finding interesting new material that sheds new light on the thinking behind the policies that led to the Great Depression. Recently I have been looking at the digital archive of Benjamin Strong’s papers held at the Federal Reserve Bank. Benjamin Strong was perhaps the greatest central banker who ever lived. Milton Friedman, Charles Kindleberger, Irving Fisher, and Ralph Hawtrey – and probably others as well — all believed that if Strong, Governor of the New York Federal Reserve Bank from 1914 to 1928 and effectively the sole policy maker for the entire system, had not died in 1928, the Great Depression would have been avoided entirely or, at least, would have been far less severe and long-lasting. My own view had been that Strong had generally understood the argument of Hawtrey and Cassel about the importance of economizing on gold, and, faced with the insane policy of the Bank of France, would have accommodated that policy by allowing an outflow of gold from the immense US holdings, rather than raise interest rates and induce an inflow of gold into the US in 1929, as happened under his successor, George Harrison. Having spent some time browsing through the papers, I am sorry — because Strong’s truly remarkable qualities are evident in his papers — to say that the papers also show to my surprise and disappointment that Strong was very far from being a disciple of Hawtrey or Cassel or of any economist, and he seems to have been entirely unconcerned in 1928 about the policy of the Bank of France or the prospect of a deflationary run-up in the value of gold even though his friend Montague Norman, Governor of the Bank of England, was beginning to show some nervousness about “a scramble for gold,” while other observers were warning of a deflationary collapse. I must admit that, at least one reason for my surprise is that I had naively accepted the charges made by various Austrians – most notably Murray Rothbard – that Strong was a money manager who had bought into the dangerous theories of people like Irving Fisher, Ralph Hawtrey and J. M. Keynes that central bankers should manipulate their currencies to stabilize the price level. The papers I have seen show that, far from being a money manager and a price-level stabilizer, Strong expressed strong reservations about policies for stabilizing the price level, and was more in sympathy with the old-fashioned gold standard than with the gold-exchange standard — the paradigm promoted by Hawtrey and Cassel and endorsed at the Genoa Conference of 1922. Rothbard’s selective quotation from the memorandum summarizing Strong’s 1928 conversation with Sir Arthur Salter, which I will discuss below, gives a very inaccurate impression of Strong’s position on money management. Here are a few of the documents that caught my eye. Perhaps the chief uncertainty or danger which confronts Central Bankers on this side of the Atlantic over the next half dozen years is the purchasing power of gold and the general price level. If not an immediate, it is a very serious question and has been too little considered up to the present. Cassel, as you will remember, has held up his warning finger on many occasions against the dangers of a continuing fall in the price level and the Conference at Genoa as you will remember, suggested that the danger could be met or prevented, by a more general use of the “Gold Exchange Standard”. This is a very abstruse and complicated problem which personally I do not pretend to understand, the more so as it is based on somewhat uncertain statistics. But I rely for information from the outside about such a subject as this not, as you might suppose, on McKenna or Keynes, but on Sir Henry Strakosch. I am not sure if you know him: Austrian origin: many years in Johannesburg: 20 years in this country: a student of economics: a gold producer with general financial interests: perhaps the main stay in setting up the South African Reserve Bank: a member of the Financial Committee of the League and of the Indian Currency Commission: full of public spirit, genial and helpful . . . and so forth. I have probably told you that if I had been a Dictator he would have been a Director here years ago. This is a problem to which Strackosch has given much study and it alarms him. He would say that none of us are paying sufficient attention to the possibility of a future fall in prices or are taking precautions to prepare any remedy such as was suggested at Genoa, namely smaller gold reserves through the Gold Exchange Standard, and that you, in the long run, will feel any trouble just as much as the rest of the Central Bankers will feel it. My suggestion therefore is that it might be helpful if I could persuade Strakoosch too to come to Algeciras for a week: his visit could be quite casual and you would not be committed to any intrigue with him. That there is an impending shortage of monetary gold. That there is certain to be a decline in the production by the South African mines. That in consequence there will be a competition for gold between banks of issue which will lead to high discount rates, contracting credit and falling world commodity prices. That Europe is so burdened with debt as to make such a development calamitous, possibly bankrupting some nations. That the remedy is an extensive and formal development of the gold exchange standard. From the above you will doubtless agree with me that Strakosch is a 100% “quantity” theory man, that he holds Cassel’s views in regard to the world’s gold position, and that he is alarmed at the outlook, just as most of the strict quantity theory men are, and rather expects that the banks of issue can do something about it. Just as an aside, I will note that Strong is here displaying a rather common confusion, mixing up the quantity theory with a theory about the value of money under a gold standard. It’s a confusion that not only laymen, but also economists such as (to pick out a name almost at random) Milton Friedman, are very prone to fall into. A study by the Financial Section of the League [of Nations] of the progress of economic recovery in Europe, which, he asserts, has closely followed progress in the resumption of gold payment or its equivalent. A study of the gold problem, apparently in the perspective of the views of Cassel and others. The submission of the results, with possibly some suggestions of a constructive nature, to a meeting of the heads of the banks of issue. He did not disclose whether the meeting would be a belated “Genoa resolution” meeting or something different. That I did not share the fears of Cassel and others as to a gold shortage. That I did not think that the quantity theory of prices, such for instance as Fisher has elaborate, “reduction ad absurdum,” was always dependable if unadulterated! That I thought the gold exchange standard as now developing was hazardous in the extreme if allowed to proceed very much further, because of the duplication of bank liabilities upon the same gold. That I much preferred to see the central banks build up their actual gold metal reserves in their own hands to something like orthodox proportions, and adopt their own monetary and credit policy and execute it themselves. That I thought a meeting of the banks of issue in the immediate future to discuss the particular matter would be inappropriate and premature, until the vicissitudes of the Dawes Plan had developed further. I am not at all sure that any formal meeting should be held before another year has elapsed. If it is held within a year or after a year, I am quite certain that it I attended it I could not do so helpfully if it tacitly implied acceptance of the principles set out in the Genoa resolution. Stratosch is a fine fellow: I like him immensely, but I would feel reluctant to join in discussions where there was likelihood that the views so strongly advocated by Fisher, Cassel, Keynes, Commons, and others would seem likely to prevail. I would be willing at the proper time, if objection were not raised at home, to attend a conference of the banks of issue, if we could agree at the outset upon a simple platform, i.e., that gold is an effective measure of value and medium of exchange. If these two principles are extended, as seems to be in Stratosch’s mind, to mean that a manipulation of gold and credit can be employed as a regulator of prices at all times and under all circumstances, then I fear fundamental differences are inescapable. And here is a third document in a similar vein that is also worth looking at. It is a memorandum written by O. E. Moore (a member of Strong’s staff at the New York Fed) providing a detailed account of the May 25, 1928 conversation between Strong and Sir Arthur Salter, then head of the economic and financial section of the League of Nations, who came to New York to ask for Strong’s cooperation in calling a new conference (already hinted at by Strakosch in his December conversation with Strong) with a view toward limiting the international demand for gold. Salter handed Strong a copy of a report by a committee of the League of Nations warning of the dangers of a steep increase in the value of gold because of increasing demand and a declining production. Strong responded with a historical rendition of international monetary developments since the end of World War I, pointing out that even before the war was over he had been convinced of the need for cooperation among the world’s central banks, but then adding that he had been opposed to the recommendation of the 1922 Genoa Conference (largely drafted by Hawtrey and Cassel). Governor Strong had been opposed from the start to the conclusions reached at the Genoa Conference. So far as he was aware, no one had ever been able to show any proof that there was a world shortage of gold or that there was likely to be any such shortage in the near future. . . . He was also opposed to the permanent operation of the gold exchange standard as outlined by the Genoa Conference, because it would mean by virtue of the extensive credits which the exchange standard countries would be holding in the gold centers, that they would be taking away from each of those two centers the control of their own money markets. This was an impossible thing for the Federal Reserve System to accept, so far as the American market was concerned, and in fact it was out of the question for any important country, it seemed to him, to give up entirely the direction of its own market. . . .
As a further aside, I will just observe that Strong’s objection to the gold exchange standard, namely that it permits an indefinite expansion of the money supply, a given base of gold reserves being able to support an unlimited expansion of the quantity of money, is simply wrong as a matter of theory. A country running a balance-of-payments deficit under a gold-exchange standard would be no less subject to the constraint of an external drain, even if it is holding reserves only in the form of instruments convertible into gold rather than actual gold, than it would be if it were operating under a gold standard holding reserves in gold. Governor Strong added that, in his estimation, it was very important that the men who undertook to find the answers to these questions should not be mere theorists who would take issue on controversial points, and that it would be most unfortunate if the report of such a commission should result in giving color to the views of men like Keynes, Cassel, and Fisher regarding an impending world shortage of gold and the necessity of stabilizing the price level. . . . Governor Strong mentioned that one thing which had made him more wary than ever of the policies advocated by these men was that when Professor Fisher wrote his book on “Stabilizing the Dollar”, he had first submitted the manuscript to him (Governor Strong) and that the proposal made in that original manuscript was to adjust the gold content of the dollar as often as once a week, which in his opinion showed just how theoretical this group of economists were. Here Strong was displaying the condescending attitude toward academic theorizing characteristic of men of affairs, especially characteristic of brilliant and self-taught men of affairs. Whether such condescension is justified is a question for which there is no general answer. However, it is clear to me that Strong did not have an accurate picture of what was happening in 1928 and what dangers were lying ahead of him and the world in the last few months of his life. So the confidence of Friedman, Kindelberger, Fisher, and Hawtrey in Strong’s surpassing judgment does not seem to me to rest on any evidence that Strong actually understood the situation in 1928 and certainly not that he knew what to do about it. On the contrary he was committed to a policy that was leading to disaster, or at least, was not going to avoid disaster. The most that can be said is that he was at least informed about the dangers, and if he had lived long enough to observe that the dangers about which he had been warned were coming to pass, he would have had the wit and the good sense and the courage to change his mind and take the actions that might have avoided catastrophe. But that possibility is just a possibility, and we can hardly be sure that, in the counterfactual universe in which Strong does not die in 1928, the Great Depression never happened. 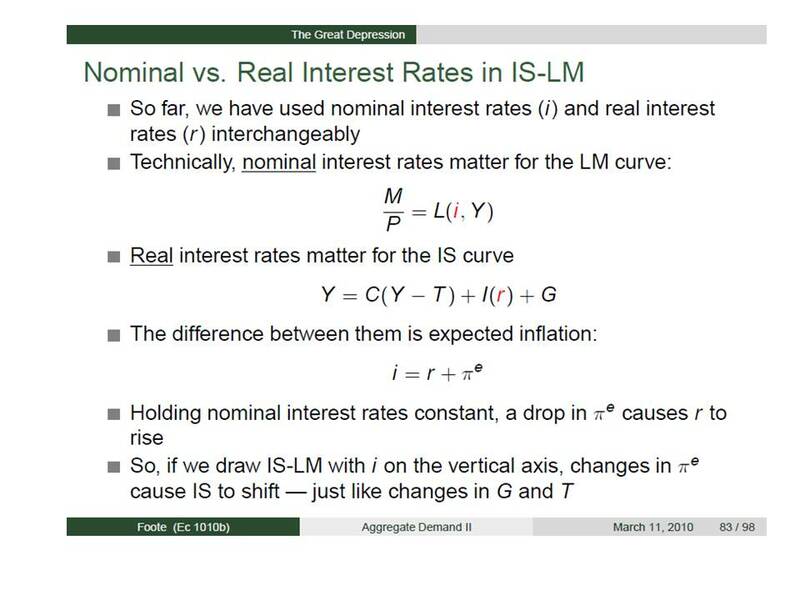 Last Friday, Scott Sumner posted a diatribe against the IS-LM triggered by a set of slides by Chris Foote of Harvard and the Boston Fed explaining how the effects of monetary policy can be analyzed using the IS-LM framework. What really annoys Scott is the following slide in which Foote compares the “spending (aka Keynesian) hypothesis” and the “money (aka Monetarist) hypothesis” as explanations for the Great Depression. I am also annoyed; whether more annoyed or less annoyed than Scott I can’t say, interpersonal comparisons of annoyance, like interpersonal comparisons of utility, being beyond the ken of economists. But our reasons for annoyance are a little different, so let me try to explore those reasons. But first, let’s look briefly at the source of our common annoyance. The “spending hypothesis” attributes the Great Depression to a sudden collapse of spending which, in turn, is attributed to a collapse of consumer confidence resulting from the 1929 stock-market crash and a collapse of investment spending occasioned by a collapse of business confidence. The cause of the collapse in consumer and business confidence is not really specified, but somehow it has to do with the unstable economic and financial situation that characterized the developed world in the wake of World War I. In addition there was, at least according to some accounts, a perverse fiscal response: cuts in government spending and increases in taxes to keep the budget in balance. The latter notion that fiscal policy was contractionary evokes a contemptuous response from Scott, more or less justified, because nominal government spending actually rose in 1930 and 1931 and spending in real terms continued to rise in 1932. But the key point is that government spending in those days was too meager to have made much difference; the spending hypothesis rises or falls on the notion that the trigger for the Great Depression was an autonomous collapse in private spending. What interests me is the suggestion that the “money hypothesis” is contradicted by various stylized facts. Interest rates fell. The real quantity of money rose. In fact, these two stylized facts are exactly what you’d expect from tight money. The fact that they seem to contradict the tight money hypothesis does not reflect poorly on the tight money hypothesis, but rather the IS-LM model that says tight money leads to a smaller level of real cash balances and a higher level of interest rates. To see the absurdity of IS-LM, just consider a monetary policy shock that no one could question—hyperinflation. Wheelbarrows full of billion mark currency notes. Can we all agree that that would be “easy money?” Good. We also know that hyperinflation leads to extremely high interest rates and extremely low real cash balances, just the opposite of the prediction of the IS-LM model. In contrast, Milton Friedman would tell you that really tight money leads to low interest rates and large real cash balances, exactly what we do see. 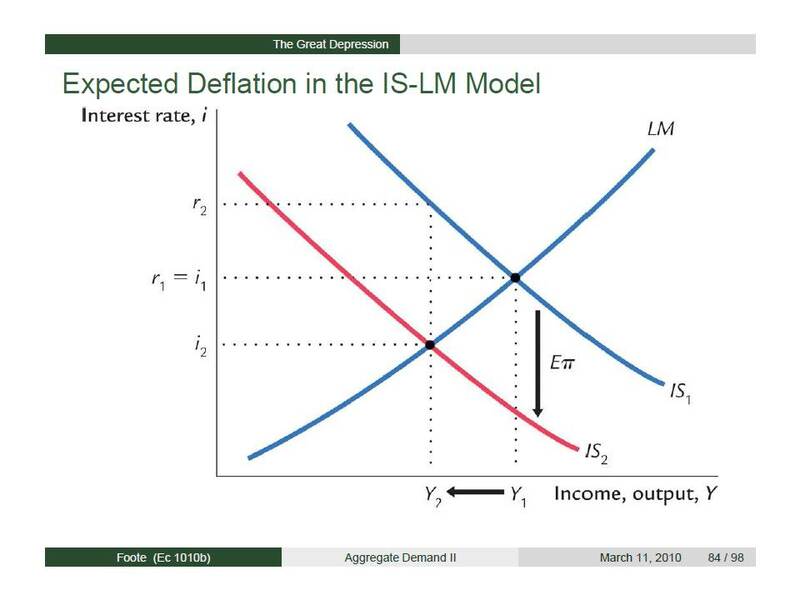 Thus, expected deflation raises the real rate of interest thereby shifting the IS curve to the left while leaving the LM curve where it was. Expected deflation therefore explains a fall in both nominal and real income as well as in the nominal rate of interest; it also explains an increase in the real rate of interest. Scott seems to be emotionally committed to the notion that the IS-LM model must lead to a misunderstanding of the effects of monetary policy, holding Foote up as an example of this confusion on the basis of the first of the slides, but Foote actually shows that IS-LM can be tweaked to accommodate a correct understanding of the dominant role of monetary policy in the Great Depression. The Great Depression was triggered by a deflationary scramble for gold associated with the uncoordinated restoration of the gold standard by the major European countries in the late 1920s, especially France and its insane central bank. On top of this, the Federal Reserve, succumbing to political pressure to stop “excessive” stock-market speculation, raised its discount rate to a near record 6.5% in early 1929, greatly amplifying the pressure on gold reserves, thereby driving up the value of gold, and causing expectations of the future price level to start dropping. It was thus a rise (both actual and expected) in the value of gold, not a reduction in the money supply, which was the source of the monetary shock that produced the Great Depression. The shock was administered without a reduction in the money supply, so there was no shift in the LM curve. IS-LM is not necessarily the best model with which to describe this monetary shock, but the basic story can be expressed in terms of the IS-LM model. 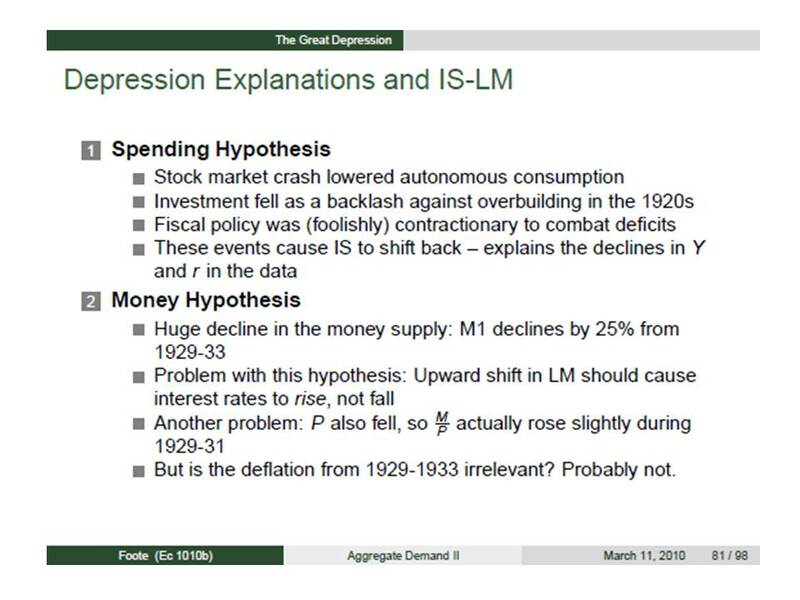 So, you ask, if I don’t think that Foote’s exposition of the IS-LM model seriously misrepresents what happened in the Great Depression, why did I say at beginning of this post that Foote’s slides really annoy me? Well, the reason is simply that Foote seems to think that the only monetary explanation of the Great Depression is the Monetarist explanation of Milton Friedman: that the Great Depression was caused by an exogenous contraction in the US money supply. That explanation is wrong, theoretically and empirically. What caused the Great Depression was an international disturbance to the value of gold, caused by the independent actions of a number of central banks, most notably the insane Bank of France, maniacally trying to convert all its foreign exchange reserves into gold, and the Federal Reserve, obsessed with suppressing a non-existent stock-market bubble on Wall Street. It only seems like a bubble with mistaken hindsight, because the collapse of prices was not the result of any inherent overvaluation in stock prices in October 1929, but because the combined policies of the insane Bank of France and the Fed wrecked the world economy. The decline in the nominal quantity of money in the US, the great bugaboo of Milton Friedman, was merely an epiphenomenon. As Ron Batchelder and I have shown, Gustav Cassel and Ralph Hawtrey had diagnosed and explained the causes of the Great Depression fully a decade before it happened. Unfortunately, whenever people think of a monetary explanation of the Great Depression, they think of Milton Friedman, not Hawtrey and Cassel. Scott Sumner understands all this, he’s even written a book – a wonderful (but unfortunately still unpublished) book – about it. But he gets all worked up about IS-LM. I, on the other hand, could not care less about IS-LM; it’s the idea that the monetary cause of the Great Depression was discovered by Milton Friedman that annoys the [redacted] out of me. UPDATE: I posted this post prematurely before I finished editing it, so I apologize for any mistakes or omissions or confusing statements that appeared previously or that I haven’t found yet.